We're sorry, the LARGE Tattoo Artist Dragon T-Shirt is currently out of stock. NOTE: COD is NOT available for tattooing kits and outfits. Please do not choose COD as your payment method when checking out. Additional shipping charges above the standard price-based shipping rates are required on all of our kits. The additional shipping cost will not be added into your total on check out. You will be notified to verify the additional fee before you are charged. Please check the green section of our Shipping Table for current rates. Or call us for current rates. Shipping for tattooing kits and outfits may vary depending on the country it will be shipped to. Please call for current shipping rates. This is one of our best selling kits for its value. 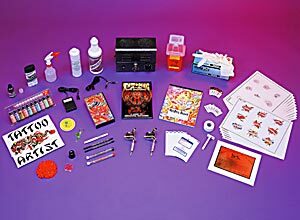 This kit comes with our Puma Quick Change tattoo machines and a Black & Silver Power Unit 1. The machine frames are made of a heavily chrome plated investment casting with stainless steel hardware. They also include 8 wrap coils, rubber nippled armature bar, nickel plated 2 piece springs, silver contact screw, our patented (D356,944) LeeverLoc Fastener Device, 10 MFD 35 volt capacitor, and our 2 piece stainless steel tubes (the grip and tube are one piece – only the tip is soldered on). It also includes our book Tattooing A to Z by Huck Spaulding and our instructional video The Art of Tattooing. 1	2 oz. Bottle of VooDoo Brand™ black liner ink.